Is there a better name for a Rocket League team? Probably not. Back in 2009, coolcole93 figured he was the best Supersonic Acrobatic Rocket-Powered Battle-Cars player in the world. He joined the Psyonix forums, where he met Doomsee and Fyshokid, the latter by spamming one of his own replays under a post. Fyshokid had his revenge. “It turned out very quickly that I wasn’t the best player in the world because Fyshokid destroyed me,” says Coolcole, laughing. The trio has been talking, and playing, since, and have now moved onto Rocket League where they play EU tournaments as Team Rocket. The team also includes digdog22, though being in the US he typically competes with Air Force Two, as well as I Am A Tree, who's filling in for Fyshokid while he travels. Team Rocket competes in ESL, MLG, and Gfinity tournaments, posts tutorial videos on its YouTube channel, and streams on Twitch as TeamRocketRL. Last week, I talked to Team Rocket about how the rest of us can become better Rocket League players. 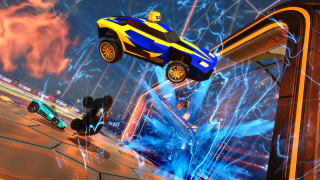 Between Supersonic Acrobatic Rocket-Powered Battle-Cars and Rocket League, how much would you say you’ve played to get where you are? Doomsee: I think I worked this out at one point, actually. For the six years we’ve been playing, I think it was something like 5,000 hours. Coolcole: Are you serious? Don’t they say that it takes 10,000 hours to become a certified expert or something? Fyshokid: I don’t think I’ve played that much, actually. I played Battle Cars a lot, but I think two months after release I left it for about half a year and it turned out everyone had gotten better. Coolcole: I played you, Fysho, and I destroyed you and I was really disappointed. Fyshokid: Yeah, I was disappointed as well, so I didn’t play it as much. I probably only logged between 300 and 500 hours in Battle Cars at the most. And then Rocket League, I’m probably already at also that same point, between 300 and 500 hours. What mistakes do you think new Rocket League players make most? Coolcole: The kickoff. The kickoff. It was worse in Battle Cars when there was no skill-based matchmaking. Now that we’re in the higher rankings in Rocket League we don’t see this as much, but new players, when they’re doing a kickoff—say it’s a 2v2, if you start at the back in the goal, and your teammate starts to either side, there’s no point in you going for the ball. By the time you get halfway down the pitch to the ball, every other player has already got there. So what you’ve done is left the goal wide open for literally no reason. For some reason it takes a lot of new players a long time to learn that, doesn’t it? Doomsee: That comes under positioning, doesn’t it, as well. In general, positional awareness. If you watch Sunday league football [soccer], with like three-year-olds, it’s basically two goalies, and then there’s everybody else around the ball in a big huddle, just following it around. That’s exactly what it’s like with beginner Rocket League. Everyone’s just going for the ball when there’s a giant empty pitch. When playing as a team, do you have set positions? Coolcole: It’s sort of blurred, I think. I mean, in Team Rocket, in theory I am the defensive player, but if I stay back all the time that’s going to invite pressure onto us. If I’m not moving forward when we’re on attack, to an extent, then I’m inviting pressure and I’m making our opponent's job of clearing the ball far easier. So yeah, I think there are positions in the sense that one player will be ultra attacking—so Doomsee is ultra attacking, he’ll always be looking to get forward as far as he can, to chase the ball, and I’m sitting back more. But there still are times I’m going forward, and there are times I’m the furthest man forward and Doomsee’s the furthest man back. Fyshokid: I don’t know about everybody else, but I do that as well, just because I don’t trust my teammates until a few minutes into the match. You know, I don’t know how they play, so I usually try to play a bit defensive, just to see how it plays out. Doomsee: I like to play every role and just go around the entire pitch. [Laughs] Saving and scoring. Yeah, you don’t know what your teammate’s style is, you don’t know if he’s going to start defending or attacking, and so you just kind of be weary. Which means I get a bit greedy with the ball, because I can’t really trust my teammates yet until I know what they’re playing like. But yeah, defending is the least popular choice, because in any game, you want to be the person at the top of the leaderboards getting the most goals, and you want to be like the star player. So I think most people just naturally, when they pick up the game, they want to score as many goals as possible, so I don’t think people defend naturally as their first choice. Do you have any tips on playing goal? Coolcole: I think initially what I had a lot is that I was too hesitant. So I’m thinking, “Right, I’m a defender, I should be in the goal, or I should be as far back as possible.” And I’d see my opponent had the ball, and I’d think, “Do I go to them? Oh no, I can’t because if I go to them and they get it over me it’s an easy goal.” And all that means is, if they’re good enough to take a decent shot, they can pick their spot or take a pass, or do anything they want. They have all the time in the world. So, I’m really having to force myself to think, even though I am in defense, it doesn’t mean I have to be passive. I think defending aggressively—and this is something I’m starting to learn—is important. You still want to be first to the ball and chasing the ball down when you’re on defense. Aerial plays probably elude new players the most, and I don’t know that there’s any tip other than to practice a lot. Is there anything you think people don’t understand about aerials? Fyshokid: Yeah, basically. You have to be able to not only know where the ball is going, but be able to fly to that point. You also need to be able to get into a proper trajectory early in your flight, so you can use the extra time you have to aim the shot. And that’s what a lot of players are having problems with. They can hit the ball, but it just goes flying in some random direction, and the hardest part is being able to aim it. Which car models are your favorites, and do you think it makes any difference? Coolcole: [Laughs] That’s because it’s ugly, and I think it’s hilarious, and [Doomsee] hates it. Well that’s the main reason, really. I don’t think there’s a difference. Fyshokid: I just use Venom because it’s cool. No other reason. Doomsee: That was my favorite as well, until Takumi came out. Then, that’s by far my favorite. Until they remake Zippy and put that in Rocket League. Where do you want to take the team from here? Doomsee: We’re going full out. [Laughs] Any competition we find, whatever day of the week, whatever time, we basically go for it. Every Sunday, we compete in ESL for Rocket League. So we do that every Sunday. You usually have about 200 teams compete every week. So we play in that every week. And then there’s Gfinity on Friday, which is another tournament. And then there’s the MLG Pro League, isn’t there, which—ahem—we didn’t qualify for. [Laughs.] But hopefully next season. But we’re definitely trying to go all the way with our competition and be as competitive as we can. Fyshokid: Of course, I can’t compete since I’m in South Korea right now, and there are no Asian servers or anything, but there’s this guy called I Am A Tree filling in for me while I’m away. Aside from you guys, what are the best Rocket League players and teams we should be watching? Coolcole: My personal favorite team that isn’t us is Shazoo. They’re a team—who are they? That’s Meeps, Oneill, and Vogan, right? Is that his name now? Doomsee: Yeah, and Skyline, who used to be called Mephistofes. Fysho: Oh really? I didn’t know that. Coolcole: Meph was, in my opinion, he was just a god at Battle Cars. He could shoot from anywhere and it would just fly into the top corner. So if he gets to anywhere near that sort of form in Rocket League, they will be a force, Team Shazoo. Fyshokid: And there’s Cosmic Aftershock, which is basically everyone’s favorite team at this point. I like them as well. Doomsee: Cosmic Aftershock, obviously everyone thinks of Kronovi and Sadjunior, but as we were saying before, because Gibbs is their defensive player, he’s obviously the glue that holds them together. So without him, they would have no proper—obviously Kronovi and Sadjunior can defend, but with Gibbs, he provides the support so he can attack as well as defend very well, so Kronovi and Sad can do their thing. I think, as well as Cosmic Aftershock and Shazoo, I would go with—not because they’re probably the best team in Europe—with Flipsid3 Tactics. They’re like us, they remind me of us, they’re there to have fun. Obviously they want to win and do the best they can, but they’re there to just have a laugh and chat with each other. And they don’t take themselves too seriously, which is great. Do you have any favorite goals as a team? A last minute win? Doomsee: Sunday’s ESL, it was the monthly finals and we’d qualified to get in, so we were in the top eight, basically, and we’re playing against Team Epic who are another top 10 EU team. We didn’t start off too well. It was a best of five, so we’re losing two nill in the series. And we’re like, ah, hanging our heads in shame. And every time we’ve lost two nill in a series, we’ve never come back to even win another game. So it was four all in overtime, and we’re just like, “Oh my god.” So we spent five minutes playing overtime, and then eventually I scored again, and I just screamed again, even louder, and we’d gotten it to two all. And then I think we won that series three two. So we came back from a two nothing deficit, four seconds left, to win three two. Coolcole: What I loved about that specific goal so much is—you know you said we scored at four seconds—at 12 seconds I put in a cross and you aerialed for it, using all your boost, and Yemen made a brilliant save. So everyone’s thinking, “Oh, that’s the chance.” But instead of feeling sorry for himself [Doomsee] trots back to the corner, picks up boost again, meanwhile I’ve dodged to the other side of the map, and I’ve knocked the ball against the wall, and then the goal happens. Doomsee: I think I dreamt it. But yeah that’s our shining moment. You can follow Team Rocket on their YouTube channel and Twitch page. For more tips, check out their great tutorials.